Helen Hays, APR, is the Public Information for Jefferson County and the Owner of Helen2o: Fluid Communications, a communications consulting and whitewater kayak instruction business started in May of 2012. 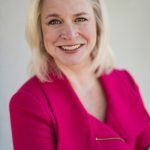 Helen has worked in a number of communication leadership roles in many Birmingham companies including, National Director of Communications at HealthSouth, Vice President of Internal Communications at Regions Financial Corp., Public Relations Manager at Southern Living, and Media Specialist at UAB. Her career started in broadcasting with a stint in radio and then in television as a producer at Fox 6. Helen is also an avid whitewater enthusiast and holds the following ACA (American Canoe Association) certifications: Level 4 Whitewater Instructor, Level 3 Instructor Trainer, Adaptive Paddling Endorsement and is the current ACA State Director for Alabama.